The Mayor of Liverpool’s Inclusive Growth Plan (2018) clearly articulates the City’s ambition for our children & young people. An important action listed under the priority for children & young people is to renew the Special Educational Needs & Disability Strategy. To this end we are delighted to introduce Liverpool’s SEND Strategy for 2019 – 2022, which sets outs the partnerships priorities. Each priority has an assigned lead officer and an underpinning action plan. The accountable body for the delivery of the strategy is the SEND Partnership Group, a strategic forum, with a wide range of representatives from across the partnership. We wish to thank everyone whose contributions has informed the development of this strategy, particularly those from children, young people, their parents & carers. Support you in understanding the new system for children and young people from birth to 25 years with special educational needs and disabilities. Give you information about childcare and early education for children with special educational needs and disabilities. Provide you with information about how your child’s school supports pupils with special educational needs. See School Local Offers. Help you to understand your role in ensuring that your child’s needs are met. Set out what you can expect from health services that support children and young people with a range of medical needs. Make clear what options are available for young people to continue in education, training and/or employment. Give you clear criteria for accessing services. Guide you through education, health and social care processes that ensure children and young people with the most complex needs are identified early and supported with an Education, Health and Care Plan. Make transition a seamless process to independence and adulthood for young people. It is a legal requirement that the Local Authority seeks from children and young people with SEN or a disability, and the parents of children with SEN or a disability, comments on the Local Offer, specifically on its content, the accessibility of the information contained within it and how it has been developed and reviewed (including how children, parents and young people have been involved in the development and review of the Local Offer). Where comments have been received from parents, children and young people, the Local Authority is required to publish these, along with its response to the comments, on its website and any comments so published must be in a form that does not enable any individual to be identified. Any comments which you make on the Local Offer via these webpages may therefore be published on the Local Authority’s website, along with the Authority’s response to those comments; however, neither your name nor any other personal details by which you might be identifiable will be published. By making comments on the Local Offer via these webpages, you consent to those comments being published on the Local Authority’s website. What is an Education, Health and Care (EHC) assessment? An EHC needs assessment looks in detail at the special educational needs (SEN) of a child or young person (aged 0-25) and the support required to meet those needs. The assessment pulls together information from parents, children and young people, the school or setting they attend and any professionals who are involved. It is the Local Authority that is responsible for carrying out the EHC needs assessment under the Children and Families Act 2014. The purpose of the assessment is to decide whether a child or young person needs an EHC plan. For further information including how to request an EHC assessment please see the Local Authority's EHC Assessment and Planning Document. Most children and young people (aged 0-25) can have their needs met through the school or setting providing SEN support. This is where the school or college makes additional or different provision to meet the needs of the child or young person. This can include tasking other professionals for their advice or support. For most children and young people this support will be enough. However, if a child or young person does not make enough progress despite this support, an EHC needs assessment may be the next step. For further information including how to request an EHC assessment please see the Local Authority's EHC Assessment and Planning Document. their physical, emotional and social needs and their health needs. In deciding whether to undertake an EHC assessment, the Local Authority must consider all the evidence provided about what steps have been taken by the school or setting to meet the child or young person's needs and whether, despite all the additional support the school or setting have provided over a reasonable period of time, the pupil has not made expected progress. In addition to this, all children and young people who currently have a statement of SEN will undergo a transfer review process within the next 3 years to convert their statement into an EHC Plan under the new system. This is where the setting makes additional or different provision to meet the needs of the child or young person (aged 0-25). This can include asking other professionals for their advice or support. The setting should take action to remove barriers to learning and put effective provision in place. This is done through a four part cycle of Assess, Plan, Do and Review. Assess - the school or setting gets a clear understanding of the child or young person's needs through teacher assessment, the child or young person's progress and attainments, the views and experience of the parent, the child or young person's own views and, where relevant, advice from external professionals. Plan - the teacher and Special Educational Needs Coordinator (SENCo) agree in consultation with the parent and child or young person the adjustments, interventions and support to be put in place, the impact it is expected to achieve and set a clear date for review. Do - the support and interventions are put into place, with the class teacher remaining responsible for working with the child or young person on a daily basis. 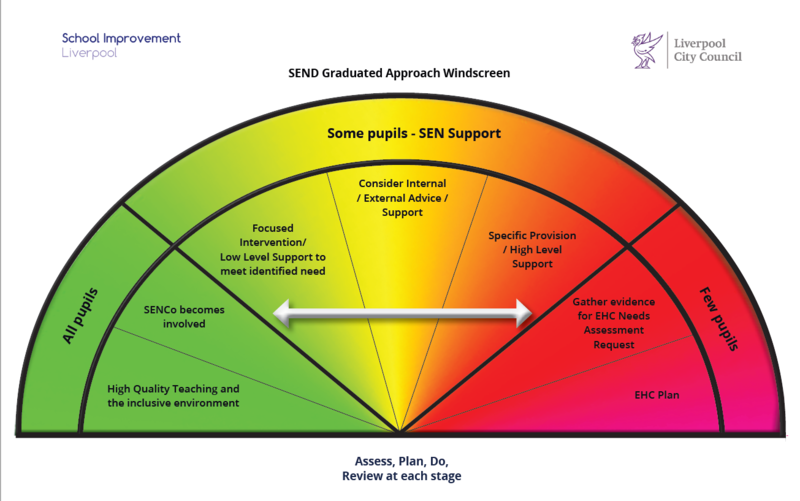 The SENCo supports the teacher in further assessment of the child or young person's strengths and weaknesses and advising on effective delivery of the support. Review - the effectiveness of the support and the impact it has had on the child or young person's progress is reviewed on the agreed date. This then feeds into the assessment of the child or young person's needs and the support is then revised taking into account the child or young person's progress and development. This would then start the cycle again. The review process may indicate that a multi-agency approach to meeting the child or young person's needs, possibly using an EHAT (Early Help Assessment Tool) may be appropriate. advice or support from external specialists such as educational psychologists, specialist teachers and therapists. What information and advice is available on the new system? The Children and Families Act 2014 says local authorities must provide information advice and support about special educational needs (SEN), disability, health and social care for children and young people aged 0-25, and their parents. In Liverpool this service is provided by Liverpool Parent Partnership Service (soon to be renamed Liverpool SEND Information, Advice and Support Service). how they can access this support. More information is available on their Local Offer page or on tel: 0151 233 0496. The Independent Support Service is provided by Liverpool Personal Service Society (PSS). Their Independent Supporters can offer support specifically around the EHC assessment process, either for people requesting an assessment for the first time, or for those transferring from a statement of SEN to an EHC plan. More information is available on their Local Offer page or on tel: 0151 702 5552. What is the process for transferring statements to EHC plans? To transfer children and young people with statements to the new system, there must be a 'transfer review' which includes a requirement to carry out an EHC needs assessment. To find out when a child or young person's statement will transfer please see the document Liverpool Local Transfer Plan. The Local Authority will use the existing Annual Review process as the basis for the new assessment. Schools and specialist teams were made aware of these changes before the autumn term 2014 which enabled some transfers to take place before the end of that term. Schools have received comprehensive training on person centred planning which ensures the review process holds the child or young person at the centre. Partners, such as health and social care, will be requested to refresh their information on a child or young person subject to consultation with parents or the young person about the appropriateness of existing reports. The EHC needs assessment requires a focus on outcomes and the LA will be expecting information that will help produce good outcomes. The timescale for completing an EHC plan is 14 weeks from the date of the Transfer Review process letter. During the period of transition, all parents or young people will have the opportunity to meet with a local authority officer as requested or needed. Is an EHC plan a legal document? An EHC plan is a legal document written by the local authority. It describes the special educational needs that a child or young person (aged 0-25) has and the support that they will be given to meet their needs. It also includes any health and social care provision that may be needed. In certain situations around the EHC needs assessment and plan, parents and young people can appeal but there are a number of other ways of resolving concerns before going through this formal procedure. In the first instance, it is worth trying to discuss the situation with the Education Officer responsible for dealing with the child or young person's assessment. Meetings can be requested to discuss any concerns and to explore whether a solution can be reached. Parent Partnership Service or the Independent Support Service can support parents and young people with this. (SEND) complaints: A guide for Young People aged 16-25 in education.